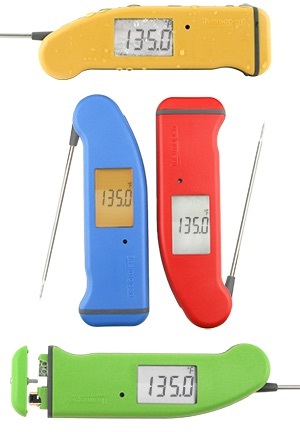 Frieda Loves Bread: Thermapen Digital Food Thermometer - A Cool Kitchen Tool! 0 Thermapen Digital Food Thermometer - A Cool Kitchen Tool! I love to watch cooking shows, and America's Test Kitchen is one of my favorites. 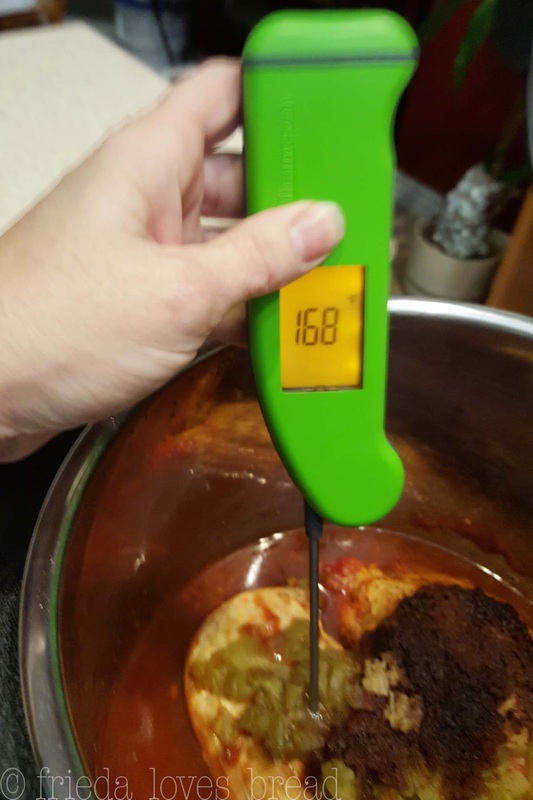 Every time they pull out a digital thermometer, it's the Thermoworks Thermapen Mk4, considered the choice of food thermometers of professional chefs. 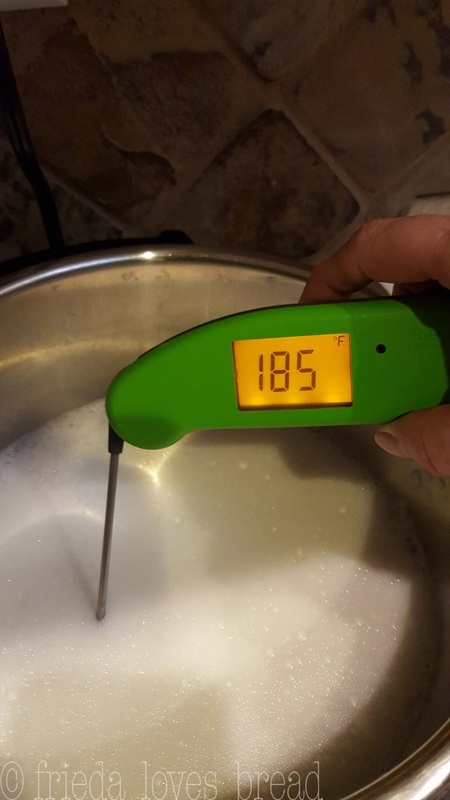 I had many readers that wanted to make homemade yogurt and asked, "What's the best thermometer?" So, I do what I always do...hit the Internet and do some research. Much of the research pointed me to Thermoworks and their line of digital thermometers. 2-3 second readings? FAST is just as important as ACCURACY. Backlight? I found this quite by accident. There is a light sensor dot on the Thermapen, that when it's covered, the display lights up. It also senses when there is low ambient light and lights up on its own. It will turn off after 10 seconds, which helps preserve the battery life. First, let me tell you WHY having a food thermometer is helpful. For many years while making bread, I used the 'clean finger' to test the temperature of my milk/butter mixture for making dinner rolls. I never knew what the exact temperature was, just knew that it had to be 'just right.' Not hot, not cool, body temperature warm. Having the right temperature helps kick the yeast into action and speeds the process of making a great bread. Start with too low of a temperature, and the yeast struggles to activate, taking a longer time for your bread to rise. Ever have a piece of meat that looks done, but raw when you cut into it? Same here - when barbecuing meat or pressure cooking, it takes some guess work to know exactly when your meat is done and safe to eat. You want a skinny probe that has a sharp point - able to pierce through the meat without losing the "juice," and keeping your meat tender. You also want a FAST thermometer. 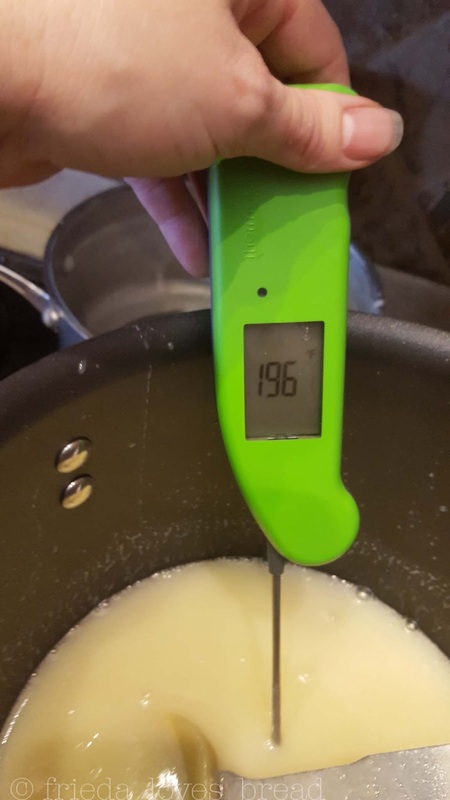 You don't want your meat cooling too quickly while taking the temperature or your milk for yogurt cooling too quickly for the optimal time to add the starter. This Thermapen is one of the fastest I've used. 3-4 second readings are common, which is very important when you are cooking. You can see how quickly it measures my scalded milk for yogurt. One of the features of the Thermapen Mk4 that I stumbled on by accident is that it LIGHTS up! Theres's a little black dot near the display, and when you cover it, the display lights up. None of my other digital thermometers did that. It makes reading the temperature So. Much. Easier. The Thermapen display can be read either vertically or horizontally, making it easier to read for both left handed and right handed folks. After owning a few thermometers, both traditional and digital, I can see why this Thermapen is the choice of professional chefs, and can be a valued cool kitchen tool in your home. 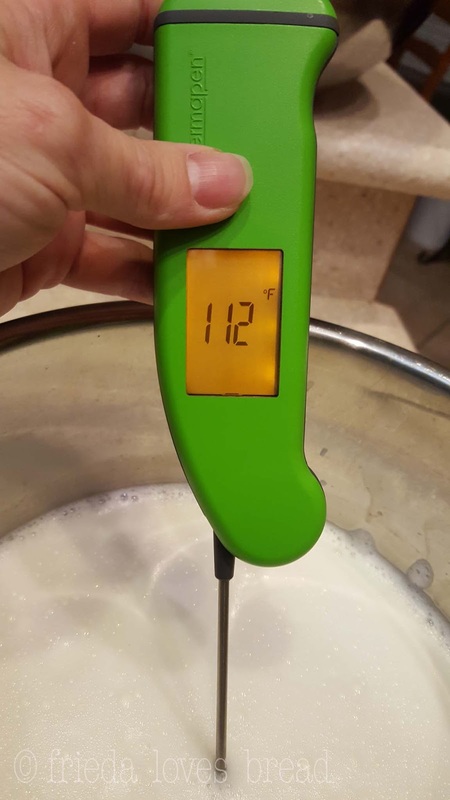 Don't let the price of this digital thermometer scare you - for the value, fast readings, accuracy, and waterproof features, it's worth the cost. 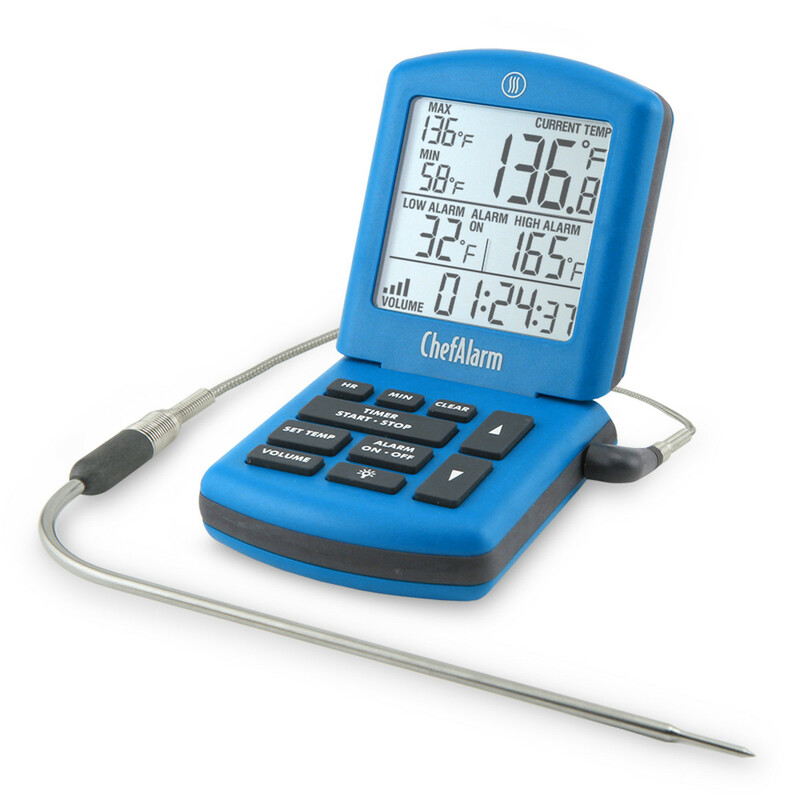 A 2 year warranty is much better than other less expensive thermometers. I'm happy with the performance and quality of this digital thermometer, which I have tested many times over the last few months. - Must be comfortable to use - feels durable and sturdy in my hands; doesn't slip. - Easy to store - Probe folds down and takes minimal space in my kitchen drawer. - Easy to clean - Yes; wipe probe down with sudsy washcloth, rinse and dry. If a Thermapen Mk4 is not in your budget, no worries - There is a popular ThermoPop option that gives you the same fast, accurate readings with a backlight and splash proof display, at a budget-friendly price. If you need a digital thermometer that does a little bit more, you may want to consider the ChefAlarm series, that includes adjustable high/low alarms, count up/down timers, and splash proof design. 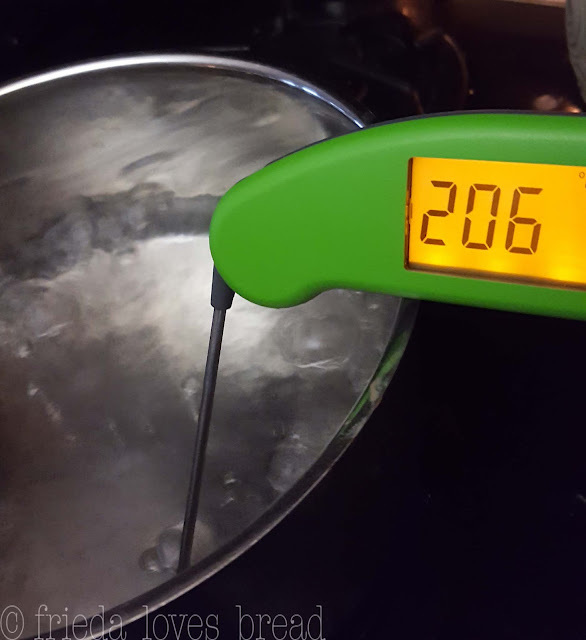 This can be very helpful in cooking a turkey/roast with a pre-set temperature alarm or in candy making, where you would be alerted when the temperature is reached. The 46" cable is definitely a plus! 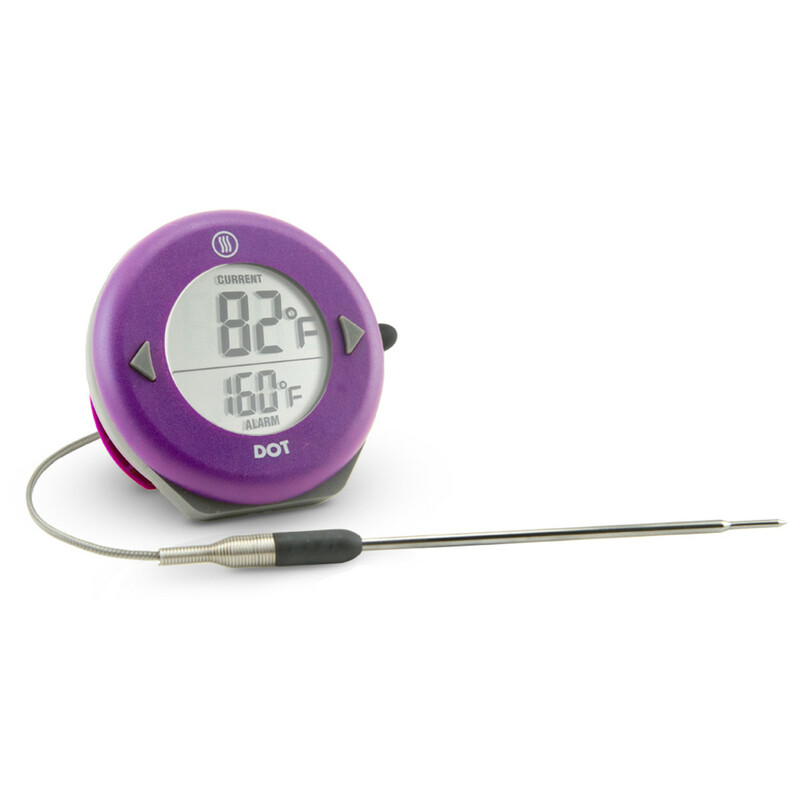 The budget-friendly cousin of the ChefAlarm is the DOT - set your temp, put the probe in, and it beeps when it is done. That's it. 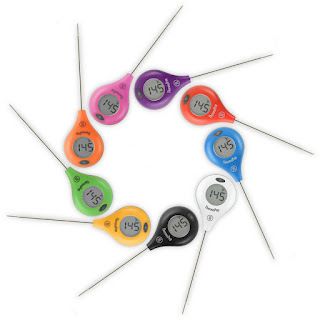 What is great about this thermometer is not only the simplicity, but the BIG easy to read digits on the display, that can be seen across the kitchen or outside on the BBQ. 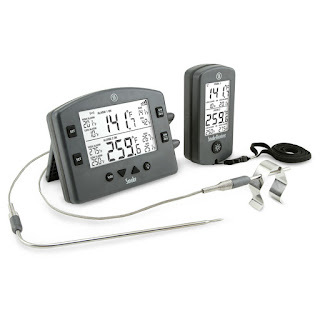 If you know someone who loves to smoke meats - this is the cadillac of thermometers, the Smoke 2 Channel Alarm Thermometer, used in competitions and by professional chefs. It has a more rugged construction, and comes with two probes, one for the meat and one for the pit that it is smoked in. It also comes with a hand held unit that allows you to monitor your meat wirelessly from 300 feet away. 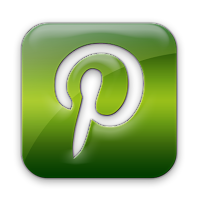 Psssst....in 2017, there will be a WiFi digital thermometer with a Smartphone app coming soon! Disclosure: I was generously given a Thermapen Mk4 to review. 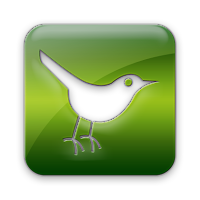 All opinions expressed are 100% mine and not influenced in any way.